AC Transit, Greyhound, Muni, WestCAT, Lynx, Amtrak, and Paratransit will have a new home starting Sunday when the $2.26 billion “Salesforce Transit Center” officially opens for full operations. Well, mostly full operations–more on that in a moment. He was talking about the entryway, shown in the photos above and below. At the front of the room is a giant departure board, intended to emulate the boards of Grand Central Station in New York and other iconic railway stations around the world. The seismic requirements take the form of huge, hefty-looking pillars holding up the vaulted ceiling. But there are also design similarities between the two stations. “Grand Central is 125 feet high. Our skylight is also 125 feet in height” said Clarke. And Transbay has something Grand Central lacks–a 5.4-acre park along the entire length of its roof. The park features thirteen different gardens with different plants, to the tune of about 16,000 plants total, which the architects and builders said were diverse enough to host a botany class. “The base of the upper level is structural foam to manage the load,” explained Turchon, meaning the upper floors are made of lightweight materials to reduce pressure on the supports below. There’s also a winding fountain along the park. When a bus drives by on the floor below, it trips electronic sensors that cause the fountain to spurt water, as seen in the next photo. Grand escalators and an aerial tram connect the ground floor to the park, which is open to the public (closing only from 1 to 5 a.m.). The middle floor, seen below, will eventually house 100,000 square feet of retail space, explained Mohammed Nuru, director of San Francisco Public Works and chair of the Transbay board. Word has it they have already signed up SF Fitness and Philz Coffee, plus a dentist, although that’s it for now. There will be additional ‘pop-up’ shops until more space is on long-term lease. The idea is to eventually provide enough retail and things to do that one could almost “spend the day here,” said Nuru. Of course, Transbay is still primarily a terminal and transportation hub. The bus boarding level houses 37 bays, all clearly marked with digital displays that show each bus’s destination and other details. There’s ample room for buses to pass each other. There’s plenty of natural light on the bus level to help passengers stay oriented. A metal lattice allows natural airflow through the bus area and large ceiling fans keep that air circulating. Clarke said he wanted bus riders to have a first-class experience in the center, and designed this space accordingly. As with the old Transbay Terminal, there’s a bus-only freeway ramp that allows buses to bypass city streets and drive directly to and from the Bay Bridge decks without competing with cars and trucks. One hopes that at some point in the future a lane will be reserved on the entire bridge for buses, much as they were for Key System trains long ago. Back then, because lanes were reserved for transit vehicles, the bridge had more capacity than it has today. Muni and Golden Gate Transit buses access the terminal from a separate, street-level loop, as seen below. There’s no way for a bus that starts on the streets of San Francisco to get up to the main bus level that is connected to the bridge, seen above, and vice versa. Meanwhile, the aerial tram, which will take people directly from street level to the roof-deck park, is a little behind schedule, and won’t open until late September. Of course, there’s also the elephant in the room–or rather the basement. Underneath the entire length of the building there’s a giant empty box, designed to eventually have tracks, platforms, and trains. The train station part of Transbay is currently just a big hole under the center. Image: CAHSR. Behind the escalator in the main hall there are breakout panels underneath the floor, designed to house another set of escalators and two staircases to take passengers down to the high-speed rail and Caltrain level, as seen in the above rendering. But that won’t open until the $4 billion downtown extension tunnel is built, connecting Caltrain’s current terminus at 4th and King Street with this new station. “Not in our lifetime,” quipped one reporter on the tour. The earliest expected arrival date for trains, according to the Transbay representatives, is 2028. Want to see the new terminal for yourself? There will be a public open house and celebration from noon to 4 on Saturday, with regular bus service beginning the following day. More pictures from the tour below. If only the private sector would step up and provide the High-Speed Rail money then we can build the train extension in which it would open in 2021 instead of 2028. Private sector would step up once Federal government steps up. Right now California is putting up all the money. Did anyone get a tour of the train station? I’m pretty there’s been no construction down there, other than the essentials to keep the rest of the place functioning. “visa versa”? Didn’t know there was a credit card, or international travel involved in that phrase, which is actually vice versa. That’s why it would be fun to tour it! Maybe the private has better things to do with its money than pour it down a hole. Amtrak has been curiously cagey about when bus service will begin serving the Salesforce Terminal. First, they sent out a message that the ticket office at the Temporary Transbay Terminal would close on Aug 10 and buses would move to a bus island at Main & Howard on Aug 13, then they rescinded the notice. Their messages have said “we hope to move to the Salesforce Transbay Terminal…” as if that’s not a done deal. My efforts to pin them down have been met with…crickets. Something is going on behind the scenes between Amtrak and the Transbay Authority, but they are keeping it quiet. My guess is that the Transbay Authority is trying to soak Amtrak, and they are playing hardball. It will be interesting to see what develops. Agreed, but they wouldn’t take me down there (I see today they took the Chron down though, grrr). But they did confirm what you (Michael Ball) said…there’s no construction, just some water storage and emergency generators. Looking how private investment typically happens around the world, it’s most often around running trains. So it would surprise me to see that money this early. Maybe closer to 2025. Maybe it could be a navigation center for the homeless for a decade or two, seeing as it will be that long until trains start using it. 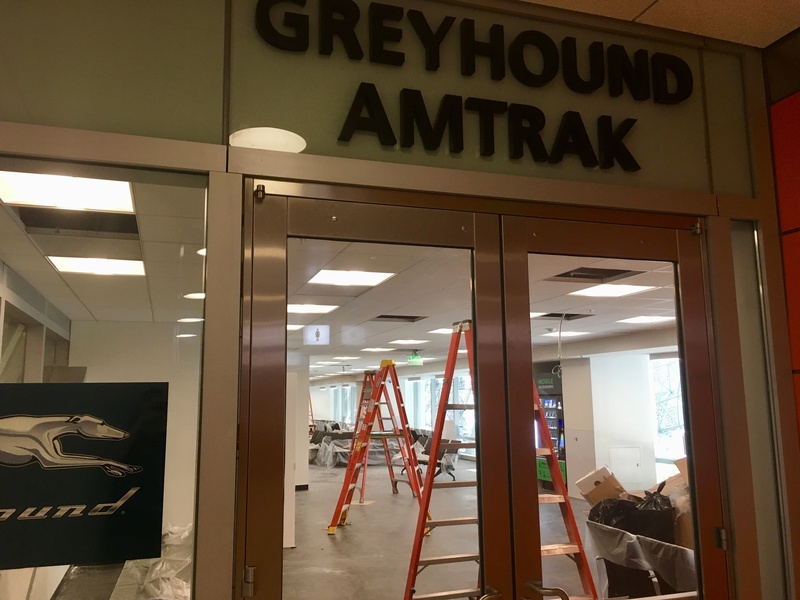 Basically Amtrak baulked at paying the rent for the bus deck space they had been assigned, and instead opted to share Greyhound’s space and split the costs with them. This has delayed the move while TJPA and Amtrak hash out the details. Whether you think the rent asked for by TJPA is reasonable or not is a matter of opinion. It’s kinda hard to think of any other organization that would want to rent Amtrak’s space, so hardballing Amtrak for cash probably isn’t going to pay off for TJPA. This kind of seems like the sort of thing that should have been worked out before building a $2.26B bus terminal for which Amtrak was a primary beneficiary, but what do I know? Amtrak is a minor player in all of this. No Amtrak trains will ever serve the station, only the Thruway buses – and those buses number far fewer than AC Transit and Muni buses. Thanks Rick. You are now my official copy editor. I know I sure needed one when I was a reporter…but I also know how much more you have to do these days. Takes a village! Keep up the good work! Thank you for confirming my suspicions. Open Thread: Room for Private Vehicles in Red Carpet Lanes? What if the money had been spent on minor upgrades to stations throughout the East Bay, such as adding arrival signs, benches, and shelters? What if the money were spent on more buses, more drivers, and better bus fleets with comfortable seats and suspensions?